As a Church of England School we consider Religious Education to be a core subject, which lies at the heart of the curriculum and has an important role in reflecting and conveying the distinctive Christian character of the school. This character includes wanting every child to know they are precious to God. As a Church school we seek to nourish Christian faith but cherish all expressions of faith which are compatible with our ethos. In line with Church of England guidance, 5% of curriculum time is dedicated to RE (over and above time spent on collective worship) and within that 5%, between two thirds and three quarters is devoted to the teaching of Christianity. At St Richard’s we follow the London Diocesan Board for Schools scheme of work. This covers the two attainment targets of ‘learning about religion’ and ‘learning from religion’. We feel this is important for community cohesion within the wider community and inclusive to those with faiths different to Christianity. Each day the school comes together for assembly (Collective Worship) and through the year we celebrate major Christian Festivals and seasons. This we do in partnership with St Richard’s Church next door. Our worship is always respectful of those of a different faith or no faith. But we believe it is an important part of helping children to choose their own path in life and to be respectful of those from whom we differ. Good worship supports a rounded education and helps equip and inspire children for life. 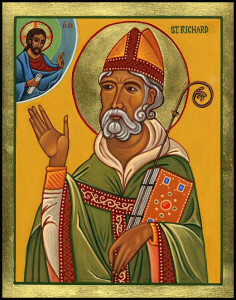 Our School is named after St Richard who was the Bishop of Chichester from 1244-53. Although from a wealthy and well-educated background, inspired by the example of Jesus Christ, Richard lived a frugal life and dedicated himself to the physical and spiritual wellbeing of ordinary people.